A depiction of Xuanzang, associated with Journey to the West, meeting Emperor Taizong of Tang. Sitting on the left is Xuanzang (602-664), the Chinese Buddhist monk who was the model for Tang Tripitaka in Journey to the West, the famous novel featuring Sun Wukong. He went all the way to India and brought many scriptures back to China. “Tripitaka” is an honorific title given to monks who are well versed in Buddhist scriptures. 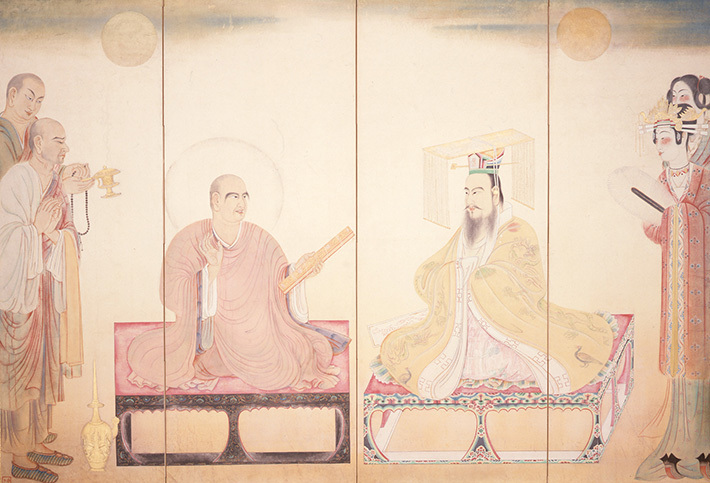 This painting portrays a scene in which Xuanzang has returned to the captial Chang’an and is having an audience with Emperor Taizong of Tang (598-649). Taizong, seated on the right, is wearing a dragon-patterned robe, which is the symbol of the emperor, and the Chinese royal crown. The artist probably learnt the details of such personal effects from The Thirteen Emperors, which is considered to have been painted by Yan Liben (?-673), an artist of the Tang dynasty. This is an ambitious work by Hirokata. Based on his studies of ancient Chinese and Japanese paintings and his experience in India, he contrasts the sacred and the secular on the left and right in unique brushwork.